Wax the car every month right after you wash it, and nothing beats hard paste wax for shine. Paint protection Brisbane eliminate fears of damage on your vehicle finish from chips, scratches and punishing outdoor weather. If that’s what you learned about protecting your car, it’s time to set aside the old wisdom. If you’ve never given your car this level of tender, loving care, we’ll walk you through it. Apply sealant only when it’s 55 degrees or warmer, keep your car out of direct sunlight while you work, and follow these steps. For goodness’ sake, don’t use dish detergent. It’ll hurt your paint. Some people say to steer clear of the wash pad because it’s easy to drop, running the risk that you’ll get damaging dirt and yard flakes in it. Some people say not to use the wash mitt, either, because the fabric cuff can scratch. My advice: Buy the mitt and flip the cuff inside the cavity. No scratches, no drops. You may dread drying the car because it involves either using Chamois, which are so annoying, or buying a bunch of towels. Instead, use a silicone water blade to pull water off like a squeegee. A single towel will soak up what’s left. You might have used clay bars in the past to get the sap, tar, and bug guts that washing glides right over. Those are old news too, and now there’s something better: Nanoskin AutoScrub. Once the car’s dry, spray a detailing lubricant over a section of the car, and then run the AutoScrub Mitt in circles over it. Wipe dry with another towel, and move to the next section. You only need to use the AutoScrub when the paint’s surface feels rough after a wash, so figure on a whole-car scrub only twice a year. Look for a cleaner specifically made for your wheel material. Chrome takes a harsher cleaner than anodized aluminum, and clear-coated wheels need a product that won’t damage that coating. Buy a long-handled brush for extra leverage, since cleaning brake dust is a job and a half. Use a smaller lug brush to get the tight space around lug nuts. Clean and dry one wheel at a time, and then apply Wheel Wax. Polish it off when it hazes over. You only have to use Wheel Wax twice a year, so skip it otherwise. Before you apply anything to the car, mix a bonding agent into the paint sealant to increase protection. Blending 1/4 cup of DuraGloss 105 sealant with 1 tablespoon of DuraGloss 601 bonding agent will give you enough liquid to do one coat of a VW Golf-sized car. Scale up or down depending on the size of your vehicle, but keep that 4:1 ratio. Don’t dawdle—you want to use this stuff within an hour. Apply the sealant in circular motions to 1/4 or 1/6 of the car. (You don’t want sealant or wax to dry and sit for too long, which is why you work the car one section at a time.) Say you start with the hood, front fenders, and front bumper for the first section. When the sealant gets hazy, buff it out with a towel in the same circular motion with which you put it on, and move to another section, such as driver-side doors, side sills, and pillars. And don’t forget the roof. Wrap a towel around the tip of a bamboo barbecue skewer and use that to sweep away dry wax from around emblems, decals, door handles, antenna mounts, and between body panels. 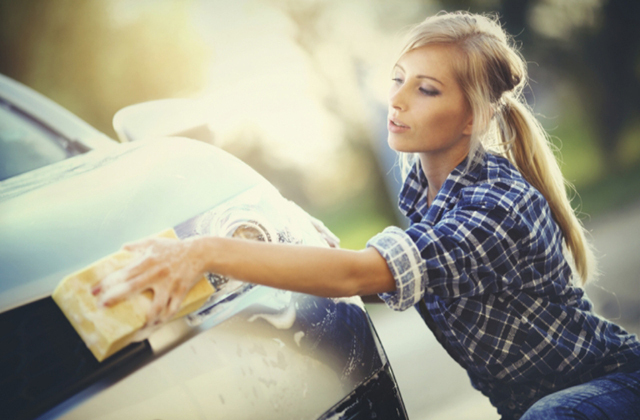 Nothing is as forgotten during a wash as your car’s weatherstripping, plastic trim, and headlights. Don’t forget. Rubber weatherstripping lines the perimeters of windows, windshields, and doorjambs, and over time it dries out and crumbles. Sunlight fades black plastic trim pieces and glazes over plastic headlight covers. Use Plexus on UV-vulnerable headlights and trim pieces, and use Pflege on all weatherstripping. Rub in the Plexus with a towel, but leave the Pflege alone after you put it on. Skip the Plexus on older cars’ circular or rectangular glass headlights. Find them on Amazon—they aren’t easy to find elsewhere. Use automotive-specific glass cleaners. Household cleaners like Windex contain ammonia that’ll eat through weatherstripping. Waffle-pattern polishing cloths scrub bug guts better than typical towels. A good interior cleaner works on plastics, vinyl, leather, rubber, metal, carbon fiber, and wood and contains UV protectant to prevent color fading. Spray on and wipe off with a microfiber towel. A stiff, plastic-bristle brush digs into wrinkled vinyl surfaces and works through hard crusts. Use something softer (like boar hair bristles) for smooth plastics that scratch easily. Automotive leather seats are usually coated and safe with these all-purpose cleaners, but test out a small spot first, just to be sure. Cloth interiors and carpet can make do with Resolve or Febreze stain remover and paper towels. You could have done two coats of paint sealant back to back, but adding a second coat of carnuba adds depth and shine. Collinite 845 liquid wax contains “copious amounts of carnuba,” according to Collinite, but lasts months longer than hard carnuba wax. Same drill as the paint sealant: Apply in circular motions on 1/4 to 1/6 section of the car at a time, and buff off with a towel when hazy. Toss your microfiber towels in the washer without any other clothing. Use laundry detergent free of dyes, perfume, and fabric softener, and don’t use dryer sheets. If they come out clean, stick them in the dryer on low heat. If they’re still black, you can try OxiClean—or just relegate the same stained towels to dirty jobs from now on. Compared to the methods we’ve been talking about, electric polishers are another step up in cost and experience required. They can, however, remove sun damage, hazy swirls, scratches, and deep-set water spots, and they’ll buff up a nicer shine than doing so by hand. If you do decide to learn the technique, then a good double-action polisher from Porter Cable or Griot’s Garage runs $100-150. You can buy kits that include polisher, pads, and pad cleaner at Chemical Guys, AutoGeek.net, or Autopia. Buy in for everything is $200, the cost of two pro detailing jobs. Once you have it, you use very little per wash – $5 worth of soap and sprays – and won’t have to restock for a long time. As long as you wash the car at least every four weeks and police those acidic bird droppings as soon as they show up, you need only apply paint sealant once or twice a year. Enjoy the shine, and let the compliments roll in. Click here to avoid bird droppings from your car.